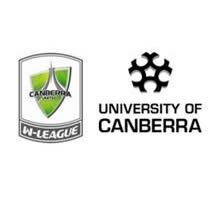 Canberra United will sport a new front of shirt sponsor for Westfield W-League Season 7 with the University of Canberra taking the prominent position for the new campaign. “We are delighted to have the University of Canberra increase its support for Canberra United by becoming the new front of shirt sponsor,” Canberra United CEO Heather Reid commented. “The University has supported our national league team for a few years and it’s great to know they have a commitment to women’s sport. Being part of the work that’s being done through the Sporting Commons is a bonus for us. “Many players and staff of Canberra United have experienced the value of being students at the University of Canberra and we have also benefited from the support of University interns on a range of research projects. To me, the University of Canberra and Canberra United provide a wonderful opportunity for continued improvement in our mutually beneficial relationship”. University of Canberra Vice-Chancellor Professor Stephen Parker said the University was delighted to be increasing its support for Canberra United from back of shorts sponsor to front of shirt sponsor for the next two seasons. “We have a long relationship with Canberra United and this new arrangement builds on that,” Professor Parker said. “Our plan is to become Australia’s leading university for sports education and research and this partnership will help us get there. I look forward to joining my colleagues and students to cheer on Canberra United in the upcoming Westfield W-League season,” he added. As part of the deal, sports studies and communication students will be able to undertake internships with the elite sporting team. Among the staff involved in providing research support under the deal will be former Canberra United goalkeeper Jocelyn Mara, who is now a teaching fellow and PhD researcher at the University. The University of Canberra will also have naming rights of the Rising Star Award (under-20 player of the year) presented at the club’s annual end of season awards function. Canberra United player Nicole Begg (nee Sykes) is currently studying environmental science and her sister Ashleigh Sykes is an alumna, having graduated with a Bachelor of Sports Coaching and Exercise Science in 2013. Canberra United’s Westfield W-League season commences in mid-September with a full fixture list, plus details of returning players and new signings to the club, as well as exciting opportunities to take part in the Canberra United Roadshow to be released in forthcoming weeks.